Explanations of Brexit, Trump and populist movements elsewhere have tended to divide opinion between those who emphasise social class and those who emphasise identity, particularly race. Robbie Shilliam’s important book cuts through such divisions: for him, ‘class is race’. 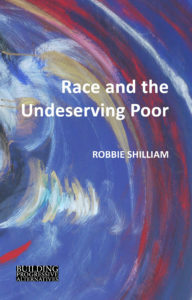 He reaches this conclusion via a fascinating genealogy of the ways in which political and policy distinctions between the ‘deserving’ and ‘undeserving’ poor have been historically racialised by political elites in Britain and thereafter used as a tool of government. Part of the series, ‘building progressive futures’ (edited by Matthew Watson and the late David Coates and published by Agenda), Shilliam’s book examines past thought and practice to cast a light – as all the best genealogies do – on important but often neglected aspects of our present. Shilliam’s story starts against the backdrop of British colonialism. Plantation slavery was perceived by many conservative English political thinkers in the late eighteenth century as a potential threat to the behavioural qualities associated with the ‘deserving’ poor in England. A slave’s condition did not allow them to develop the virtues associated with the ‘English genus’ of ‘industriousness, prudence and patriarchy’. Notably, both sides of the debate on reforms to the ‘poor laws’ in the 1830s presented their case through a desire to avoid the emergence of vices associated with the slave – ‘idleness, licentiousness and anarchy’ – among the English poor. In the latter part of the nineteenth century, following the abolition of slavery, ostensible ‘evidence that free blacks could not cast off their slave essence,’ meant that an ‘Anglo-Saxon family [increasingly] separated itself from an agglomeration of non-white colonial subjects’. Many English poor were, around the same time, included in the political franchise and so given greater political agency within this ‘family’. Eugenics emerged as a science that supported these tendencies. Picked up by social reformers such as William Beveridge, it permitted racial divisions between those conceived as capable (Anglo-Saxon British) and incapable (Caribbean colonial) of responsibly receiving new forms of social security. It also permitted new policy interventions geared towards the ‘improvement’ of a (frequently racialised as Black) poor white English, and increasingly urban, ‘residuum’. The establishment of the modern post-war welfare state formally dissolved distinctions between undeserving and deserving as part of a new national compact. But Shilliam contextualises this against the backdrop of the arrival of Black and Asian Commonwealth immigrants, required to contribute to the post-war reconstruction effort. He shows the ways in which organised labour and the left were complicit with political elites such as Enoch Powell on the right in establishing divisions between an inherently deserving ‘white working class’ and these new arrivals. Indeed, it is noted that it was not only the right that protested Powell’s sacking following his infamous “rivers of blood” speech in 1968, but also many in the trade union movement. Overlooking Powell’s important free-market attack on the national compact per se, those protestors were more concerned – and encouraged to be more concerned – at the prospect ‘of being levelled to the position of Black workers’. Practically speaking, the relative privilege of white labour had been established via informal ‘colour bars’, which often operated in the labour market through the ‘closed shop’ trade union arbitration system and in welfare through discrimination in the granting of housing and other benefits. This ensured the exclusion of Blacks and Asians (and many women) from certain professions and privileges and, ultimately, their exploitation. Indeed, ‘it was the informal [colour] bar that enabled the “white working class” to gain traction as a constituency’. Thatcher’s decimation of the national compact certainly meant that such a ‘diminution of benefits’ was very real. And to the limited extent that New Labour revived that compact, it did so in ways consistent with a multicultural ethos that that did not permit the restoration of those benefits in relative, racialised, terms. Moreover, in social policy, both Thatcher and Blair identified the residents of largely white council estates as ‘problem populations’ and targeted them for ‘(self) improvement’. Thatcher sought to encourage this through property ownership (the right to buy) and Blair/Brown through workfare and a welfare conditionality that Cameron would also embrace. Discursively, race did not disappear however. When in summer 2011 people took to the streets to protest the killing of a young Black man from Tottenham, urban white youth participated in the ensuing and widespread rioting, prompting concerns at the spread of Black culture (and, implicitly, ‘problems’). On the BBC’s Newsnight, popular historian David Starkey bemoaned the fact that ‘whites have become black’. But ‘Blue Labour and others who called for a “left exit” never critically addressed Labour’s record before Thatcher… they did not reflect upon or confront the racialized aspects of the party’s historical opposition to European integration.’ In particular, ostensibly progressive arguments for limiting immigration from within the EU (often made with allusion to a ‘progressive’s dilemma’) elide the fact that the ‘left behind’ ‘white working class’ constituency now in need of protection was both invented and privileged through the purposeful exclusion of Black and Asian immigrants (and, as Shilliam notes in places, women) from the national compact. Calls for the exclusion of Polish, Romanian and other EU citizens from what little remains of that compact may be consistent with such a position – rooted in a desire to maintain ‘native’ privileges that migrants are (bogusly) alleged to threaten – but Shilliam shows us that this cannot and should not be a comfortable position for a progressive politics. It is a position that put the 1970s anti-marketeers in uncomfortable proximity to Powell and puts today’s ‘lexiteers’ in an awkward and unacknowledged proximity to Farage. The Brexit vote of course cut right across a right-left cleavage (and, indeed, a rich-poor divide). Shilliam reminds us that ‘indices of deprivation did not strongly correlate with a Brexit disposition’ and that ‘59 per cent of the leave vote was cast by [wealthier] ABC1 social grades’. ‘Take back control’ was an effective rallying cry for a coalescence of inchoate concerns across the political spectrum pertaining to, among other things, lost empire, Englishness, sovereignty, immigration, austerity, welfare and work. We can debate endlessly what exactly it was that people sought to ‘control’. But it is notable that many of those with the least control over their lives in socio-economic terms – poor and historically disenfranchised Black and minority ethnic communities, many of whom had been ‘most detrimentally impacted by austerity’ – largely voted Remain. Race and the Undeserving Poor offers a stark warning to those in Britain (and beyond) who nostalgically envision and seek to revive a nationally closed and protected welfare state and economy because they believe it is the only way to challenge a neoliberal status quo. Shilliam shows them that their vision is a mirage, the pursuit of which has in practice always failed. The British economy has never in fact been closed, rooted as it has been in colonialism, the Commonwealth and then the EEC/EU. And to the extent that the left has pursued such closure, it has consistently ‘facilitated the rise of the socially conservative right’ because ‘there is no politics of class that is not already racialized’. Instead of contributing to the drawing of lines between deserving and undeserving, he urges the left to foster common cause among all who suffer from the dividing practices inflicted by elites who today pursue a deregulatory disaster capitalism that will reach new extremes if the Tory hard Brexiteers get their way. In many ways, Shilliam is calling for the progressive left to recognise and not fall foul of, or even unwittingly endorse, the divide and rule tactics of the right. Concretely, this means appreciating the historical role that race and colonialism (and we might add gender) has played in the pursuit of such tactics. Thereafter, it means shining a light on the places where, ‘policies detrimental to the living standards of the majority first make their cut into the social fabric… [T]he ‘micro-sites – usually coloured as “ethnic” or “immigrant” – [where] the battles for tomorrow are first won or lost.’ In the UK, the current horrors being inflicted on the Windrush generation spring to mind. Across Europe the plight of the Roma offer another pertinent case. Shilliam’s poignant concluding reflections look to another stark example. Exploring the palpable regulatory and political failures around the Grenfell tragedy, he powerfully asserts that ‘the suffering of…Tower residents…should be apprehended as the post-Brexit fate that awaits the “just about managing” in the North.’ Ultimately, he tells us, ‘Justice for Grenfell is justice for all’.